As with so many things, consumers have more choice for sun care than ever before. Now in addition to the traditional chemical sunscreens we all grew up with like Coppertone and Banana Boat, there's natural mineral sunscreen options. But what's the difference? 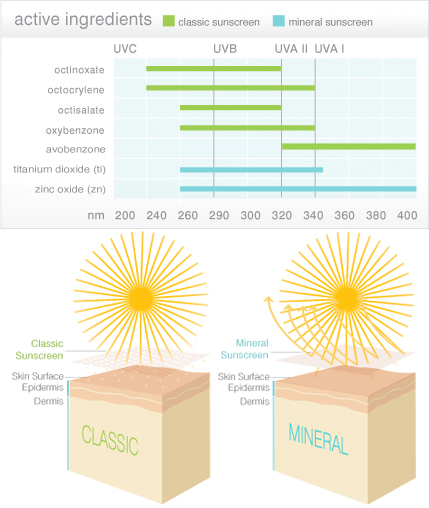 Both classic chemical and natural mineral sunscreens provide protection from the sun, but they differ in their ingredients. "Chemical" ingredients, protect by absorbing and weakening UVA/UVB rays. Mineral sunscreens, on the other hand, contain"physical" ingredients; namely mineral active ingredients such as Zinc Oxide and Titanium Dioxide that reflect and disperse UVA/UVB rays without absorption into the skin. This difference in ingredients means you have to be mindful of when you apply your SPF. For optimum effectiveness, chemical sunscreens should be applied at least 30 minutes before sun exposure. Mineral, however, can be applied immediately before stepping out in the sun. Whichever you choose, just be sure to look for broad-spectrum on the label to ensure protection against both UVB rays, which cause sunburn, and UVA rays, the leading cause of premature aging of the skin. For more, visit our natural sunscreen and repellents resources page.